Some people are addicted to antique stores. Others go for yard sales or kitchen equipment catalogs. Me, I’ve got a thing for farmers’ markets. Hypnotized by the sight of all that fresh produce, helpless under the gaze of friendly, hard-working farmers, I buy stuff that would never find its way into my basket at the supermarket. That includes items that no one in my family will actually eat, like Brussels sprouts, and ones that I have no idea how to cook, such as Jerusalem artichokes. My “problem” is so severe that I, who loathe gardening, have been known to return from a farmers’ market with a trunk full of bedding plants. Because of this, on Saturday mornings from May to October, I give the corner of State and Elm Street in Montpelier wide berth. That’s where vendors — awash in Brussels sprouts and Jerusalem artichokes and God knows what other temptations — set up one of the biggest of the state’s three dozen farmers’ markets. The Montpelier market showcases any 36 of about 70 vendors on any given Saturday, and collectively grosses more than $300,000 a year. 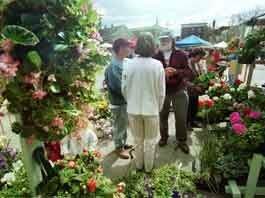 The Montpelier farmer’s market is a throw-back. There was one at the turn of the century, but after a few years, it went under. Growers resurrected the tradition in 1977, on Langdon Street, at about the time Ginny Callan moved her ground-breaking vegetarian restaurant, The Horn of the Moon Cafe, to the same block. “There was a lot of food consciousness beginning to bubble up,” Callan said recently, noting that the Hunger Mountain Co-op came into existence about the same time. “People wanted to support local agriculture. They wanted to eat healthy and eat seasonally,” she said. “It started really small,” recalled Alan LePage, a Barre farmer who has been selling his wares al fresco in the Capitol City for 25 years. “But then, as now, it was about the sustainability of small-scale, locally-based agriculture.” In the early 1980s, according to LePage, a Langdon Street merchant’s complaints sent the market down the block to its current location. The Montpelier farmers market is an institution for central Vermonters, who use it as a meeting place as much as a venue for buying food and crafts. In the space of a half hour last Saturday, I encountered at least a dozen friends and acquaintances. They were bundled against unseasonable cold and optimistically buying pots of basil and broccoli. Children and dogs scooted about, both groups happily sniffing air made fragrant by potted herbs, cut flowers, egg-rolls and several bakeries. Currently, the vendors’ most pressing concern is space. The market is being squeezed on the Elm Street side, where it abuts a federally owned parking lot that has been off-limits to the public — for security reasons — since September. Boots Wardinski, a farmer and member of the market’s board of directors, called the decision “an over-reaction.” To make matters worse, Wardinski said, authorities at the Washington County District Court have informed the farmer’s market board that access to the area beside the courthouse — which is currently occupied by at least 12 vendors each week — will be restricted starting next year, to save the grass. Vendors will have to find space for their stalls within the confines of the courthouse parking lot. “Something will come through,” said Wardinski, who runs a farm in Newbury. He said a class at Vermont Technical College has volunteered to create a design for the area to meet the needs of both the market and the court. The City Council may reconsider a plan — originally encouraged but recently nixed — to close off Elm Street on market mornings. LePage suggested the market consider moving out of town, as Brattleboro’s market has done. A less high-profile location would present a problem for the vendors. “We need to be visible,” said Wardinski. “Not just to remind the locals that we are here, but to draw in visitors.” But if it were less visibile, the market would also be less of a temptation to addicts like me. Happily, I got away last week with just some fresh salad greens, a dozen eggs and some goat cheese, all of which everyone in my family actually ate and enjoyed. Though I felt the old itch, I managed to avoid the urge to purchase several pounds of organic lard from Dayton Lanphere, proprietor of White Face Acres Farm in North Wolcott. I also resisted the blandishments of Carrie Kessler of Corinth, who was selling shitake mushrooms at the Mont Eden Farm stand. She assured me that the unusual patterning on the mushroom caps — a result of recent dramatic variations in temperature — enhanced their medicinal qualities. Some potted hollyhocks were calling my name when I stopped, fatally, by Wardinski’s Green Reaper Farm stand and was compelled, as if by an unseen force, to buy a cheerful-looking spray of flowers. A neighbor spotted me and laughed out loud. “Do you realize that marsh marigolds are in bloom up and down our road?” she asked, pointing to my bouquet. Of course I hadn’t realized. Farmers’ Market Madness had struck again. Lieutenant Governor's Race: Who's the Real Middle-Class Hero?